It's a weird feeling, rooting for the end or at least the defeat of mankind, but that is what this new trilogy of Planet of the Apes films has done. Each of the installments has done so well at tracking the progression of how these apes, namely Andy Serkis' mind-blowing creation that is Caesar, have become more human-like in their emotions as well as their mannerisms that it has become harder and harder to differentiate between the fact that what we're technically watching is a man versus beast tale. Of course, it's easy to throw those two labels around, but who actually deserves to have the title of beast fall upon them is debatable and especially in this final installment. In the inevitable War for the Planet of the Apes we find series screenwriters Mark Bomback and director Matt Reeves (Dawn of the Planet of the Apes) bringing the reinforcements that Gary Oldman's character made contact with in Dawn to the front lines and drawing the line in the proverbial sand. Reeves, who took over for Rupert Wyatt after the first installment, has crafted two distinct, but equally effective pieces of filmmaking that are as well-crafted as one could hope for. The film hits all the marks of a masterful technical achievement while at the same time deviating story expectations by not necessarily being generic summer popcorn entertainment, but are rather some heavy and heady pieces of cinema that have plenty of thoughts jumping around inside their heads as well as layers upon layers of allusions to the point each individual viewer could potentially see and receive something different when experiencing them. That said, both Dawn and now War never display that factor that pushes either of them over the edge of good, solid entertainment into something greater. It's a difficult feeling to describe given it is also a difficult thing to come up with anything negative to say or anything that specifically detracted from the experience of viewing the film, but speaking to the emotional state you reach after said experience War leaves you with a strong impression of being truly impressive, visually magnificent, but not nearly as intellectually or emotionally stimulated as it seemed you would be about midway through the movie. War for the Planet of the Apes makes us root for its primate protagonists, but it never lends the viewer the weight it seems to desire nor does it hit with enough of an impact that it will leave you contemplating all those ideas it has floating around inside its mind in your own for longer than a few hours. It is grand without necessarily being epic, distinctive, but not necessarily special. Maurice (Karin Konoval) and Nova (Amiah Miller) are taken off guard by the arrival of a new companion. Courtesy of Twentieth Century Fo - © TM & © 2017 Twentieth Century Fox Film Corporation. All of that taken into consideration, War is indeed distinctive for reasons that have to do first with being the finale of a trilogy and a link between what has been set-up by its predecessors as well as to those original films that created this mythology. Caesar has always been a mythic creature, but Reeves and Bomback have done well to establish the "wow" factor that was inherent in the first two films when Caesar had those moments where he speaks for the first time consistently throughout this final entry as Caesar has more or less become fully human in his speech and level of intelligence. This was maybe the most fascinating aspect of the film-the full circle of Caesar's abilities-as not only is he talking and understanding what is being said back to him, but he is using deductive reasoning and he is plotting escapes as well as feeling raw emotions that might force him back into a more primal state of mind. This goes back to what the movie does narratively and its lack of adherence to any traditional blockbuster structure. Sure, we know there is going to be a third act showdown of some kind, but the action scenes (especially for a movie with "war" in the title) are pretty sparse. Rather, War tends to stick to the more complex character dynamics it has set up and that it knows it can pay off in spades with this third film given it more or less has to connect to the beginning of the 1968 film. There is a particular plot point that occurs early enough in the film that we are introduced to a new kind of Caesar rather than the sympathetic leader we have come to familiarize ourselves with. With this turn, Caesar loses his sense of thoughtfulness and perspective and becomes so focused on a single objective that nothing else matters. Nothing matters to the point Caesar is willing to be as ruthless as he needs to be, but the movie does an interesting thing the first time our protagonist actually acts on these instincts-it reminds him why he can't be. And as far as tentpole blockbusters go, this is something rather rare; War holds its characters, on both sides of the fence, accountable for their actions and furthermore, self-aware of the consequences such actions might inflict. Because these characters are aware and willing to deal in what are typically fairly dire consequences it inherently makes those aforementioned dynamics all the more engaging and therefore much more interesting than a line of explosions. Watching Serkis navigate this self-conflict that we see Caesar struggle with from the first act on is what drives the film emotionally and Serkis is more on his game than ever, truly bringing every human in the audience to the side of rooting against humanity prevailing. With knowing where this re-booted trilogy of films must eventually end up though, one might think the wind could potentially be swept out from under the sails of this third and final film, but along with ushering Caesar through a series of tests and tumultuous moments Reeves and Bomback are seemingly keen on keeping us focused not only on the destination, but the fascinating journey we must take in order to get there. As previously noted, in Dawn Gary Oldman's character, Dreyfus, had successfully made contact with what was left of the armed forces and they were headed for Caesar and his tribe's base just outside of San Francisco. In War, two years have passed and battles between homosapien soldiers and evolved simians are apparently a rather common occurrence. Caesar has been smart enough to evade those seeking to kill him over the past two years, but as War opens Reeves puts us face to face with some of the harsh realities of this particular war. The human soldiers have enlisted the loyalties of former Koba (Toby Kebbell) henchmen who wouldn't dare go back to Caesar and yet they are treated like degenerates under the thumb of their new masters. "Donkey" and "Kong" spray painted on these defector's backs show us what little hope there is left of the two species ever coming to any kind of treaty and peacefully co-existing with one another. As a battalion raids the woods where Caesar is believed to be hiding the death toll mounts until the human survivors can be counted on one hand. Enter Serkis' melancholy Caesar who, even in the midst of death, finds it in his heart and his best interests to spare the lives of those who seek to kill him. He does this as a message to the human leader in hopes of conveying a merciful tone in the way that it might display it is indeed still possible for an understanding to be reached. The apes only want to find a peaceful homeland and Caesar has sent his son and another ape to seek one out-the seeds are planted early as far as homages to the original go, people. 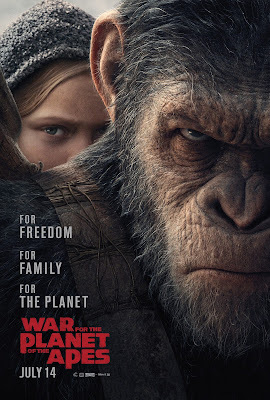 Of course, the humans don't want peace-they want to kill the apes and they are led by a vicious Colonel (Woody Harrelson) who is running a military base that is capturing apes for slave labor due to the Colonel's own nefarious plans with it all coming down to the moment of whether or not Caesar can stop him. The Colonel (Woody Harrelson) and his cronies are set for all-out war. Of course, this wouldn't be a review of one of these new Apes movies without discussing the majesty of the special effects on display. As the intelligence of the apes has evolved over the course of the series so have the motion capture effects (and they were amazing to start out with). More than ever, the looks in the eyes of the apes are affecting in ways you likely never imagined a computer generated character could be. As Maurice, Karin Konoval is the unsung hero of this trilogy as she is not only the heart of War in many ways, but she also guides the heart of Caesar. It is Maurice who serves as a constant reminder of the fact that without a sense of genuine humanity they truly are nothing more than animals. Caesar has always served as something of an inspiration to the orangutan and in this final chapter of this part of the story Maurice has to step up and remind Caesar of why he has always been that beacon of hope. Much of this is conveyed through Maurice's discovery of a young, mute girl who comes to be known as Nova (Amiah Miller). Without going into spoilers, Caesar has somewhat gone off the rails in War and is more hard-edged and less forgiving than he has been in the previous films and Nova comes to be the soft spot that shows him there are still humans out there who want to be good and who want to do things for the right reasons; she brings about the humanity that is absent from Caesar this time around, if you will. Of course, that is always the scariest thing about a villain-when they too think they're doing the right thing and that their actions are necessary for the world to ultimately be a better place. And while Harrelson is saddled with a lot to carry yet very little time to do it, it's easy to see that despite his merciless attitude he believes he is doing what must be done in order for mankind to survive. Stating that by the laws of nature apes were destined to one day rule and that because humans tried to defy that nature that it has been punishing them for doing so ever since Harrelson's Colonel is very good at convincing us of the ugly truth. Even we, as viewers, know that as he gives this grand speech in the actor's biggest moment in the film that everything he's saying is right, even if we might not be willing to accept it. Of course, this doesn't change the fact his methods are barbaric, but his reasoning is sound and this continues that tradition this trilogy has stuck with about never having black and white heroes and villains, but rather two sides fighting for what they believe is right. More than anything, War for the Planet of the Apes is something akin to a political thriller in that it certainly has aspirations of being allegorical to what is happening today, but more that it comes down to what is essentially a power struggle between these two opposing forces that will inevitably collide. And yet, while the film clearly has more on its mind than action set pieces, explosions, and cool imagery it never seems completely sure of what it wants to say. What, if any, points or messages it is trying to convey or make never come through in a way that the audience might start a conversation around it afterwards. More, what will come to be discussed are those jaw-dropping effects and Andy Serkis' praise-worthy performance. And while there are other facets of the film that I genuinely enjoyed-Steve Zahn is a scene stealer as a character who simply refers to himself as "Bad Ape" and Michael Giacchino's score is out of this world terrific-but as a piece of entertainment that clearly has something to say and wants to truly mean more than your traditional summer blockbuster it kind of comes up empty-handed. There is a real sense of how important all of what is happening is and how it isn't at the same time in War as certain characters and character moments are crafted to the point of tangible meaning while the overarching plot and structure turn out to be a more basic ride than we thought we might be in for. Ultimately, Reeves has directed a picture that veers on the side of being heavy-handed with the caveat of not coming up with anything substantial to actually say, but because so much of the construction around the ideas are done in exceptional fashion much is made up for and forgiven when it comes to the movie as a whole. That isn't to say this isn't a good movie because it lacks a clear direction as it is still a worthy conclusion to a rather impressive series of films. I just can't help but feel as if there could have been more. That this could have been better.